Alessandra Corsini lives in Rome. As a transactional analyst, she has been working for years with troubled children, adults and families. She won the Saint-Vincent prize for journalism (1977). She published “L’ultimo cielo” in the collection NOTTURNI ITALIANI (1999), and IL VENTO RACCONTA (2000), for which she won the Emily Dickinson Prize (2003). 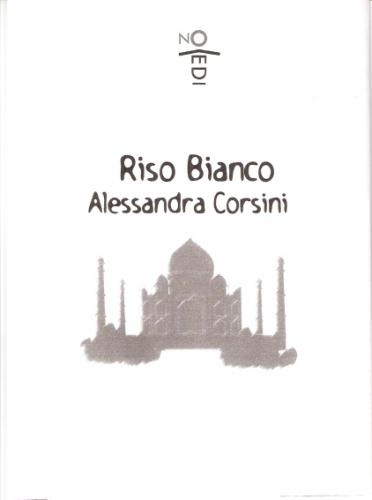 RISO BIANCO was published in 2005. The book was presented at the Frankfurt Buchmesse in 2006 as a Guest of Honour for India, at the Fiera dell’Editoria (Publishing Houses Fair) in Matelica and at the 13h, the first Italian reading and theatre marathon in Agugliano (Ancona). In 2007, she was the moderator at the presentation of CALCO, a poetry book by Monica Maggi, at the third edition of POETEKA, International Poetry Festival in Durazzo (Albania). Some of her poetry was published in the JOURNAL OF ITALIAN TRANSLATIONS of New York (Ed. Luigi Bonaffini, April 2008, translation by Diana Festa). Alessandra Corsini has a very deep knowledge of esoteric and spiritual disciplines; she loves travelling and beauty. This is a continuation of Riso Bianco - Part II from our Apr 2008 issue. The first day is one of sleep and dust. The train, Anadpur Sahib train station, master Jogi Bahjan’s house, guards at the gate, cows, men, children, women at the river. We meet at breakfast in the kingdom of fairy tales. Everything is white, clean and we are being served. Our luggage, our clothes, showers, yoga class at 10.30 a.m.
We leave our room all dressed in white, smiling, calm. It looks like a college for wealthy girls. But we’re really looking for peace, for something that leaves everybody unscathed while annihilating the past. We study the lives of the Gurus. On the first day we study the life of Nenak, sign of the zodiac: Aries. Ironic, nice, he felt very lonely as a child, him too. I like the lives of the saints, the lives of heroes, people who highlight other people and their good qualities. We have our favourites, those to whom we feel closer, an image of greatness that concerns all of us, no one excluded, no exceptions, not even for a few seconds. We take a break at noon and have a fake lunch; a cereal or a vegetable soup. Everything is spicy hot and scant. The sun is high. Those who come first earn spots in the shade and pass the time getting to know the place and measuring up their fellow travellers. Tiredness prevents me from talking. I go to my room and try to get some sleep. Maria Luisa seems to follow orders. She wakes up, sleeps, obeys. How does she do that? 2.30 p.m. Lesson on the Japji Sahib. An inborn sense of duty pushes me to get up when I was about to fall asleep. Now it’s broad daylight, somebody is missing, it’s time for an afternoon nap. Paolo lies down and falls asleep. A lot of us would like to do the same, but we keep listening, because you never know. Everything can be useful. We subdivide everything. Avtar’s Italian sounds horrible, but how can you resist such a beautiful prayer? “Ik Ong Kar Sat Nam Karta-purakh Nirbau Nirvair.” If it’s true that we were sound, I’d like to remember this chant that goes inside the memory of memories, the land we can’t forget, that pulls us in every direction and you never know why you’re crying, calls you at night, goes into your dreams, mixes up faces and love and never dies. 4.00 p.m. yoga class, a short one, we are worn out. We’ve put such a long distance between us and our homes. We chose distance to go on a journey to our hearts. It’s warm. There are fans but our bodies are about to give up. At the end of the class Sadhana explains to us some notions of yogi numerology. You give an order to your birth date to probe into the plans of the universe, because numbers are the bricks and beams of every house. Chaos breaks loose. After a nice yoga class there’s nothing better than to keep control. We ask all together. Our voices overlap but we insist. We get restless, excited and frantic. We want to know more. We want more. We take notes of others’ characteristics, hidden judgements and thoughts give a silent comment upon others’ business, some beauties can’t belong to those who are not pretty, some other beauties, ours, don’t seem to be very important or only a few people listen to them. Sadhana answers hurriedly, passes over, pleases and disappoints. He is saved by dinner at 17:30 and it will be India, new food, yoga, our journey, thoughts. In turn we’ll lose ounces and pounds. Somebody is happy. Somebody else isn’t. The sun sets upon our plates. Words and speeches fade away. Michelle and Franciane serve us dinner, they smile at us, they’re here temporarily, they’re touring India to practise yoga, to heal their pain, and receive dreams and silence. Tonight we are too tired to go anywhere. The night falls and people are still praying in the temples. We turn our eyes to the stars. I can’t understand what we’re saying. I go to bed to get accustomed to the new time zone and to start all over again tomorrow. We get up at 4.a.m. “Wake up.” Sadhana wakes us up singing. Lucky him. It’s dark, the only moment when it’s cold. I try an ice cold shower. I have to as long as they don’t fix the thermostat. Besides, according to the yogi philosophy it’s an outstanding remedy. My effort puts me in a very bad mood. Maria Luisa is like a little soldier. She gets up, washes and is ready. “Good morning.” We mutter a few indefinite words when we meet the others taking our sleep and our blankets with us. Somebody has a sheepskin, something which keeps affecting me even though it is supposed to protect you from negative magnetic fields. It still reminds me of the sheep in the nativity scene. The room for our yoga class is upstairs on the same storey where we eat. We drink the silence and that chant still coming from the Gurdwara. That chant has never stopped. It’s like a heart throbbing, the waves, the last sound I hear when I fell asleep and the first when I awake. “The Sadhana feeds our aura, it enhances our psychophysical abilities.” It sounds particularly true here in India, in a country where time slows down and rhythms change, where time is divided between prayers and poverty. It’s a blessing waking up at 4 a.m.
Who are we? A group of Europeans practicing yoga, people with their stories, a song, dreams and expectations, fears and doubts, desperation and needs just like any other human being on earth. But we are here and it’s a privilege but I don’t know how all this will contribute to the economy of the universe, that subtle economy where good and evil mix together in dosages that we ignore. Can my prayers produce any good? Or maybe my hands, my smiles or my money? What can produce good? At 4:30 a.m. the Sadhana starts. It will end at 7:00 a.m. The night fades away. Crickets come back as well as the workers and the sun. Monty comes with his yogi tea, the hills, the smells, Franciane, Michelle, Suria, even those who slept in arrive, the cleaner tables are being set for breakfast which will be served at 8 a.m.
At this time of the day houses and hills are still misty but it takes a very short while for dust and day to arrive. We hang about till 8, someone goes back to her room to wash. Words mean nothing. “It’s marvellous.” Travelling monads, we have our things to do and our reasons to be here, we do our best. We have preferences and idiosyncrasies, somebody knows already where to sit, others don’t care, breakfast is being served. Chapati is always being served, fresh and dried fruit, a bottle of water each and flowers that Monty gives to everybody. I can’t overcome my shyness, but I eventually decide to speak English, no hurry. Whatever the language I prefer to listen, follow the tones and rhythm of words, follow the soul. I see a clearer picture now. Monty, a tall and lanky American intrigues me. He looks at me with gleaming eyes and his hands are joined in prayer. He looks for me as soon as he sees me. Franciane, noble and refined, Michelle who always looks as if she has just come out of her sleeping bag, Suria, the commander of this Indian kingdom, the cook, the boy who cleans, the worker. I can’t resist human beings. As much as I try to avoid them, they fascinate me. 10 a.m. Yoga class on the second Guru: Angad. I like him. He chose to serve everybody without distinction and took care of children, the little people who will grow up one day, who will draw the future in their games and are not afraid of their hearts. At noon break we all realize that the watery soup will be served each day and we become fond of chapati. I sit anywhere as long as it’s in the shade. A tiny peace reigns in the guesthouse. Going back to our rooms becomes a ritual, but I can’t fall asleep, too many inducements. I stay in bed listening to the crickets, looking at the orange curtains and talking to Maria Luisa. Silence passes by telling stories. We go in and out our rooms, perfect and quiet wombs to take in the best that life can offer without taking any risks, at least not now. At 2:30 p.m. lesson on the Japji Sahib, but this famous sense of duty what sense is it? It’s neither one of the five senses they taught us in school nor an extrasensory perception. Still it makes you get out of your bed when you don’t want to, a kind of reverse force of gravity. At the end of each class we always find yogi tea ready for us on a small table as we walk out of the room. Monty tries to please everyone with glasses and flowers. Our friendship begins over tea, smiles and thank yous, looks and care. Monty has tapering fingers and a mellow face like that of a child. He takes care of me as if I were something precious. He touches me once in a while to remind me that he’s there. Another yoga class at 4 p.m., more difficult and higher impact, muscles hurt, they always seem too many, while breath resists the mind gets confused. We have a lot on ours minds but we don’t give in, I don’t give in, my breath accelerates and my body shakes without control in the posture of the moment. As soon as this blessed energy awakes it dances inside, reminding me of old journeys. Because yoga is a story, a story of the memory that goes back in time, gets hold of pain and suffering, of tears shed over meanness. It tears apart our fear of being close to God and of our indignity that never lets us feel blessed. Third guru: Amar Das. Became Guru at seventy-three, an old man who served Guru Angad night and day, so humble that he was scorned at, so strong that people avoided him. There were a lot of women among his disciples and this makes us already fond of him. He had that kind of faith that impresses me and used to leave justice in God’s hands. We wait for the numerology moment to enter once more into the fray and look for some traces of our destiny. It’s strange to think that knowledge and destiny have the same number. Camilla has beautiful numbers, Elda is perfect, Paolo seems a master, Maria Luisa a wise woman, I’ve the numbers of a guru, Sandra can make miracles, Livia is like Amar Das, Dharma supports hearts. Then how come then we have to struggle between our mediocrity and our fears? Dinner is good and generous, boiled rice, vegetables, even less familiar vegetables, a very tasty tofu, legumes, hot and spicy flavours. Jaswinder shows up but his eyes are not clear. Sadhana has talked so well about him that I forget about it. “He prays alone by the river.... gives thanks to God... Helps and treats everyone.” Judging by this description he seems a prophet. After dinner he guides us to the village and to the temple. Outside the enchanted kingdom it’s all darkness, dust, dryness and the usual stench that seems to cover India. We walk on an extremely narrow road where any vehicle runs, trucks, bicycles, small carts, motorcycles and I’m surprised we don’t get run over in the darkness. A continuous blowing of horns, an irregular and never ending voice. It’s so dark that I can’t see the stars. I walk behind everybody else, a torch in my hand to be seen and I realize that I have the sheepdog’s dog syndrome. Elda walks next to me and we begin to talk. The first streets of the village, the sewage, skinny dogs, shops selling antique things but I can’t tell what they’re selling, grains, fabric, holy books, colourful sweets, Indian saints, legumes, rice, open doors to a small misery, entrances that are rooms, houses and smiles. We are close to the temple, leave our shoes in the shoe deposit, a free and kind service. Suddenly in this dark night we see a large clearance of white shining marble in front of us, a tree in the centre, the floor polished by too much walking. We wash our hands and feet, the will to be clean. The temple stands powerful and still, a stone rising towards the sky. We must cover our heads and never point our feet to the altar, an offence to God. White walls, no iconography, shapes, figures, old chipped walls, an altar in the centre and the Guru Granth Sahib, the holy book, God’s words, and musicians next to the altar with blue turbans. That chant again that vibrates inside your head, creeps under your skin and travels faraway. We sit around the altar with the others, veils and turbans, the callous soles of people who have been walking for long, an old carpet soiled with every kind of stain and drenched with prayers. An ancient warrior comes by, an orange piece if fabric, a spear, wrinkles all over his body, a dagger. He is with two small children kneeling in front of the altar. All that thinness and devotion stay still, alone under God’s words. They leave and I feel sorry, I get fond of gestures belonging to prayers and devotion. Leaving the temple we take the offer, that greasy and sweet mush that runs through your hands and that my stomach can’t take. At least it reminds you that God is always generous. We put on our shoes. The night goes on, as soon as we leave the temple a few children gather around us, teenagers, young people. “Where are you from?” Laughter. They’ve never seen so many white women altogether. They ask but don’t understand. They talk and we don’t understand. Excitement spreads and space narrows. They’re swarming now. Sadhana tries to stand taller. The B group has left already and at the top of that climax Suria comes along and with a few clear words and a “shoo shoo” with her hands drives them away. We return over wet, dirty roads. I follow Monty who gets lost but I trust him beyond doubt and we end up in an even dirtier courtyard. We find the right direction again, I can tell by the dust, so our first conversation starts. He speaks a loud American and I a rusty English in an Indian night which seems timeless, the night of nights, in which you’re alive forever. It’s 4 a.m. It’s night, almost dawn. I get up reluctantly, another cold shower. Yesterday an Indian worker came to see what the problem was, found out and left. The room and its smells, wood, dirt, oils; I changed time zone and I’m getting used to this college lifestyle. Ready for the sadhana, my left knee is hurting, but I convince myself the pain will stop eventually. A new dawn at the end of the mantra “Guru Ram Das Guru”, faces look familiar now, you can tell immediately who’s there and who’s not. The Camille are a tight group, a gymnast team made of steel. Marisa and Paolo come and go, clinging together. Elda falls asleep during the mantras. Breakfast is wonderful. Monty has made a thicker porridge with lots of raisins and then fruit, yogurt and corn chapati, unbeatable. Franciane asks me to go with her on a walk along the river. “I hope early” hoping to find some time “tomorrow morning”. My schedule is too full, yoga and India overlap. Simona gets worse and worse everyday, intestinal colic, she says and sticks to this diagnosis and to an appropriate diet. The pain punishes her and changes her day for the worse. “No, better this one.” Natural remedies, good will, many ideas but her face is still drawn. Monty starts to tell me strange things. When even Franciane tells me that, I’ll start considering moving to India. Fame easily goes to my head. 10 a.m. yoga class, fourth Guru: Ram Das, I always mistake him for the previous one. The most fascinating, no one could resist him, clear ideas, open heart, ready to give and take. He starts to build the golden temple at Amristar. We look closely at the pictures of the Gurus on the wall, their faces, their clothes, their postures in order to remember a detail, an idea that will define them, a look to spy on holiness, that peculiarity that overthrows every scheme. Sadhana has no pity, classes are now very demanding, we pull and bend our bodies in every direction, even the most unpredictable ones. “Hang in there! No one is giving up, three minutes more, the worst is over.” When he says that we know he lies, the worst is yet to come. We resist all the same but we don’t know why. Inside our struggling bodies, our souls listen and await another exercise. Today’s watery soup is made with some cereal floating on liquid ketchup. I would eat anything right now. Monty tells us he doesn’t know what kind of cereal they are. He bought them at the market, an area packed with bags, baskets and human beings. “Wheat, corn?” We investigate a little then we eat. We always have the impression of having little water, two bottles each but as soon as you turn around somebody steals them so we begin to stock up. I take a half-hour nap while Maria Luisa tells me something in the yellowish light of the curtains, among crickets and workers on the same lawn. “No, not today I won’t do the Japjj Sahib.” I get up and go against my will, a supreme act of disobedience. The flies and the heat make this class unbearable. I take notes, read the text, useless repetition of concepts. Sandra sits in the front row, pays attention. She’s accurate. She’s the good pupil you can copy from. Livia, her “classmate” corrects and supports Avtar and her Italian. But only when all this becomes sound, praying voices, my misery ends and I take some rest. The yogi tea is already prepared before the other class. I sit on the step in front of the lawn where the workers are still working. One of them is older, a piece of cloth around his waist, experienced gestures, doesn’t look or talk, does what has to be done. He looks like Jesus. The tea is still hot. Children, fathers, husbands, brothers like us but most of all children; the only condition that makes us all the same. We’ve been thrown on the earth, a people without a promise land. The class starts. Monty caresses me and I go inside. Guru Arjan, incorruptible poet, had to deal with an unfaithful and traitorous brother. He collected the holy chants of Gurus and Saints in the Sacred Granth. He was repeatedly tortured by his enemies. He used to say, “Sweet is thy will oh God.” I don’t know, feed the beasts with our bodies. Surrender. Grind the need. I don’t know why life and death fight against each other. I don’t know. Every time I stress my left knee, tears come to my eyes. I guess at my diagnosis and decide to rely on Jaswinder who in the meantime examines Simona. He wants to take her to the hospital. “Screw that. I won’t go to an Indian hospital.” She takes her medicine and waits. I don’t interfere. Jaswinder speaks English with an Indian rhythm. It’s almost impossible to understand him, but he understands and takes a look at my knee. He puts an ointment on it and will come back tomorrow with an adjustable brace. He’s tall and handsome. The light of the sunset cuts across the room and in those seconds that the soul suspends I am defenceless to his deep Indian stare. Dinner is the best time, not only because we eat at last but for the sunset, for tiredness that mellows words, for colours that create beauty, for feelings of familiarity. At this time we know each other pretty well and if sometimes it is a question of judgement, other times it’s benevolence. Before the night falls we tune our hearts to the chants from the temple. Tonight we’ll have a meeting around the table, even though no one knows what this meeting is about, whether it’s a sensible and wise speech or a show of some dialectic art, it has always irritated me no matter what it was, a solemn moment with no solemnity whatsoever. Fortunately, we end up talking about Sandra and we have a good time. Now the play starts where everybody tries to convince Sandra to teach yoga. Each of us plays a role; the wise, the sympathetic, the teacher, the sister, the tough one, the listener, the idealist, the indifferent and she plays along. She defends herself, counterattacks, gives in and starts again. She finds shelter in doubts, plays a great move, “I can’t do it right now,” and all possibilities are open. Chit chat in the night, scattered groups, two or three people, a final whisper that sums up ideas and still I prefer silence that resounds inside me like a bell and makes me pray in the corners of the world. To purify my memory, now I know it. I’m here for this reason. It’s 4 a.m. I won’t get up. No Sadhana for me today. Maria Luisa gets up, goes to the bathroom, a minute-long cold shower, comes back to get dressed. I’m not moving. My left knee hurts and I’m tired of this paratrooper’s schedule. The door opens and closes. Finally I get back to sleep without feeling guilty. At 7:30 a.m. Maria Luisa rushes into the room. Getting up in a hurry and no breakfast is even worse than getting up at 4 a.m. I put a nice deep red Indian shirt on to hide my poor state of conscience and I’m out in the first dust. We gather together into the jeeps and leave. This crazy change of schedule cancels my walk with Franciane. No big deal, we’ll see each other later. We drive along the river, women washing their clothes and laying them on the grass, they look like flowers. A child wearing only a T-shirt stops to stare at us, a bustle of carts and beasts, men with turbans, walking canes, carrying loads on their shoulders or their bicycles. India is awake by now. I will never forget these loads carried by hands, heads, dragged, pushed, borne. I’ll never forget all this debt with life. On the opposite side the bank is red, a few trees, a hint of hills. We keep on driving along this wide river that renews his promise of water. Now the jeeps start to climb a narrow and winding road. There’s not enough room for two vehicles, but they pass all the same. Their horns create an opening where there is none on the overhang and I turn to fatalism, a destiny that exists beyond any decisions, a heavenly business that takes your life away. Faraway on the top of the hills you can see the white Indu temple. An old woman, as thin as the sticks she’s carrying, stretches her hand to receive something, but gets nothing. The jeeps keep on climbing. The borders of the roads in this country bring tears to my eyes. There are no fender strips, no reflecting lights, only men, poor men standing at the edge of the road as guides, in case we get lost. We get off in a small square among a few stalls of fruit, pilgrims, beggars, to start our climb. I don’t know how many stairs we have to climb but each one is a prayer and an assignment. At each side of the stair is a long line of small stalls where you can buy pictures of saints and pistachios of every kind. Monkeys are numerous here, sitting on houses and huts, roofs, and stalls. They present their babies with bewildered looks which are repeatedly photographed. Women and pilgrims climbing and descending smile and greet us. Sadhana tries to gather us. “Let’s keep together.” But we separate immediately. Some of us are ahead. Others trudge behind, nowhere to be found. Avtar is the first to disappear. I find myself alone. I’m going to meet those unknown gods with the utmost calm. I don’t know how to behave, the warmth and the begging never end. I breathe as much as possible to remember everything. Smell has always been my big memory, the story where you can find any other story. Avtar is already at the top of the stairs. Gradually we find each other. There’s also the B group and Sadhana. Even this time no one gets lost. Livia, experienced as she is, buys small bowls with flowers to offer to the gods. We follow suit, leave our shoes at the deposit and are ready, heads covered, to walk inside. We need to follow a path. An Indian offers puffed rice and crystals of sugar. We should eat them. It’s god’s gift to us but we decide to distribute it equally to the gods instead. They’ll know what to do with it. Beside Ganesh, who always soothes me, the other gods are disquieting to me. The black one, possibly Kali, doesn’t promise anything good. There are many gods, and they all have a purpose. We pay our respect to them because knowing each other they probably speak to one another. Better to leave a good impression. A picture of our group and we leave the temple; I’m hungry but look suspiciously at the food displayed on the stalls. I have only a drink. You can buy anything, blessings and sacred signs to put on your body, words, incantations, an instant of happiness, why not? We drive down with our jeeps. Nobody wants to sit close to the B group. So much for our breakfast. It’s lunchtime now and there’s nothing but the usual watery soup and tea. The water heater is working now, a miracle by the Indu gods and the Sikh plumber. I rest in my room and write in my little black diary. I jot down scattered thoughts on my journey, the silence, my fellow travellers, Jaswinder, the River and God who never gives me any rest. Japji time, we are fewer and fewer. I’m daydreaming, following a fly and I’m missing words and explanations. I’ll copy from Sandra. Eventually we recite the prayer, 23rd verse.... and listening to that sound I get some rest. Tea before Guri Hargobind, a saint and a warrior. He walked around with two swords and was a rule-breaker. I’ve always adored anarchists! He’s connected to the arch line, that nice aura which is gold around saints. I think ours is fading but we can find a solution. It’s our protection against evil, a space for God to operate, a space for intuition and beauty. I always get excited by the lesson over the sixth body. I recover my strength. We are tight together, ready, attentive and even athletic. Even Paolo looks handsome to me. As soon as we move on to numerology we start to fight again. Prima donnas fighting on a stage, after all we want to show our beauty and surely this doesn’t hurt. At the end of the class Jaswinder shows up with the brace that I have to use on my knee, ties the straps, then he tells me to regulate it by myself. “No way.” I want to be a patient this time. He asks me how much pain I can bear while turning some knobs. I feel like a thousand needles are digging into my knee. It’s an appliance for diadinamic and it would have been better if I had regulated it myself. Then he sits on my bed and something unexpected happens. A series of deep Indian stares. The light of the sunset fills the room. Lights are off, yoga, India, beauty, before love comes trust, a simple open door. I don’t disturb the silence and collect without touching the two tears running down his face. He tells me about his feeling: “I don’t know.” The same feelings he experiences when he prays or treats patients. I don’t know what is going on, either an unscrupulous ambition of the heart, or eternity systems, or just an instant of perfection? Those two tears were the worst things that could have happened to me. I give up all my defences. We’re late for dinner and I’ve lost my peace of mind. From that moment we start to talk, impossible for me to understand his English, but somehow I do. It begins with what I’ve always feared: words. The sunset is over so it’s dinnertime. Somebody goes to the village to telephone or buy something. Others disappear. The stars come out and Avtar, who’s always out of place, comes to talk to Jaswinder. Now like during the entire journey, she manipulates space and time that doesn’t belong to her. I wonder if she does it on purpose or if she doesn’t understand the terrain of intimacy. I can’t remember anything of that night, only night and darkness and I can’t hear the resounding prayers any more. Resolute, kind, Sandra takes us gently from one posture to another. “Stretch your arms, look at your third eye, breath of fire, stretch as much as you can.” We’ll call her yoga the “humane face of yoga”. It’s not competitive but good all the same. It’s morning. We get up satisfied. “How did it go?” she asks to understand, hear and be accepted. Need of love, it will never end, we will never have enough of it, it could fill the entire world. Monty is making breakfast, I observe his kindness to learn it, by observing the divine qualities of some people I’ll learn something. Once again I have to cancel my walk with Franciane, the intervals between activities are really too short. It’s a day of commercial discontent. Suria is vague about the prices of the clothes she’s selling She says a price, then changes it, gets paid and forgets about it. She asks for money, doubts discussions and critics. Suria’s sign of the zodiac is Pisces. So is it about her carelessness or is it just her sense of business? Livia, a sly old fox, is aware of everything, never gives in and most of all: “I don’t want to be screwed.” I should be with her more often. Rooms are now tight teams of members supporting each other, Elda, Manuela and Elisabetta, a frivolous and loud trio. Sadhana and Avtar, teachers, patterns, Sikh. Maria Luisa and I, intimate, calm and clairvoyant. Paolo and Marisa, symbiotic, lovers, absent. Simona and Camilla, willing and proactive, Manù and Paola, flexible and seraphic. Sandra and Livia, always attentive, curious and critical. We don’t always get along, nor do we understand each other, but we couldn’t do without one another and it’s not only because we are faraway from home but for the games of the heart that don’t care about differences in character. Today when Paola, Camilla, Manù and Livia went to Chandigar to collect tokens of Le Courbsier’s talent, I missed them. There was too much space. I missed their voices, their movements, their actions, their jokes and comments, in the class, on the lawn. We missed them. It’s hot and sunny. We have a lesson on Guru Ar Rai, a pacifist, an animalist, gentle and sensitive, the seventh guru, the seventh body, the aura, our protection, the ability to forgive. The aura of a woman is thirty-six times more sensitive than that of a man’s. It’s not an advantage but an always open account that won’t ever balance. At the end of the class I want to snuggle with Monty. I can’t believe in so much affection! “No milk.” He knows I can’t drink milk and makes me some wonderful customized tea using my favourite technique: tenderness. The Indian workers have worked at an unbelievable speed. They’ve almost completed the two small houses and the oven. We could use them for Sadhana’s birthday. Our stay at the guesthouse is drawing to an end. It’s almost impossible to perceive our expectations for change while our worry for the eighty-four steps is rather conspicuous. Our worry is of what is coming next and that we could have only imagined so far. Time doesn’t relax me very much. Jaswinder starts to occupy a space that was all mine up to now. What a distraction! I don’t like to surrender my freedom, a living sacrifice for which I gave up the gifts of life, a family, a partner, children, for an ancient search that leads me to rough distant roads, to think about my soul, heaven and men, wizards and angels stealing whispers to flowers and indifferent spirits, an alchemist who makes potions that I can’t even explain. In the afternoon Maria Luisa sitting on the bed of our room takes her pendulum and questions the invisible. Her looks change, her words gain power and just like an oracle she talks uninterruptedly, no breaks, no inflections. She’s turned into somebody else. The tone of her voice upsets me, comes from faraway. I can hardly recognize my roommate but I recognize the voices of the invisible, their power, their danger, their constant intruding into our lives. Her eyes are wide open, her voice rising and falling, the pendulum keeps swinging, going back and forth to search for truth but I don’t want to know anything else. I wait till it stops and go back to the yellow curtains and the cicadas. The man I’m looking for, sometimes it’s an angel, sometimes Jesus, or a distant walker but no one leaves footprints on the ground. I let them go, lovers and love, they were occupying too much space. Peace is over and so it’s love. It disappears quickly into the void of needs and implodes, an ancient Big Bang repeating at every instant; loving care and memories, sea and love. Jaswinder comes in the afternoon for the lesson on the Japji Sahib so we can hear the gurmuki pronunciation. He’ll teach us the Indian rhythm. We cover our heads and pray; I try not to see what I don’t like in him. There are no flaws in fairy tales. I pray. Break with tea. Lesson on Guru Teg Bahadur. He does everything: master, disciple, warrior, ascetic, lets himself be beheaded as an act of supreme sacrifice. Everything that happens is sent by God and has to be accepted. Franciane doesn’t speak a lot during dinner. I can read in her eyes the story of that man, neither good nor wise, a guest who has robbed her heart and while I’m telling her this, she cries because she hasn’t done that before, because I read secret information, because sunset ends the day and perhaps tomorrow it’s going to be better. Because the air is sweet and lawns are still resounding, I collect her pain, I hug her and while the heart is still moving Paolo comes between us. Franciane didn’t notice anything. She stays still holding me. The moon and the sun, the sadhana in the middle. Maria Luisa gets up. She seems normal. I trudge, wash and get dressed. The Japij, the exercises. We arrive safe and sound to the mantra when something unexpected happens. It’s broad daylight and the sun, big and round, enters the room. Maria Luisa gets up and starts to dance, cries, turns around, doesn’t stop, spins around, gets up again, bends, keeps on dancing following a rhythm that no one hears but she. She shakes, swings her head and spins around again and again until she crouches crying and sits on the floor. None of us can figure out how long it lasted. She’s lost her direction. Two friends hug her. We wait. She starts to tell what happened this morning, still crying. “I’ve seen the ten Gurus coming from the sun and talking to me.” I can understand just a few words, her vision continues, “What we’re doing is good. Our journey is protected.” Her story upsets me, the intrusion of a world that I know. “And together they were riding towards me.” Sometimes, I’d like to have an ordinary life. I want to leave the room. The lesson is over. Jaswinder arrives with the taxis and we go to visit a few gurdwaras of the area, then we go to eat in a langar, the refectory of a temple. The temples are small, separate from one another, white, rising among hills, a few Indians around, the holy words of the day written on a blackboard, words that Jaswinder speaks with devotion. I still believe in him. I don’t think it’s possible to spoil prayers. The sun is following us. We arrive at a larger temple with a long white stair climbing to the sky. In the middle of the stair there’s an old Sadhu, a guardian and a prophet of a wasteland. He smiles and draws the attention of every photographer. Elisabetta poses with the old Sadhu who smiles and collects money asking for more, experienced and persevering. He doesn’t miss an opportunity. Maria Luisa approaches him. They talk using their own languages. Then he leaves and goes through a small door to take a nice blue piece of fabric for a turban. “He gave it to me as a present.” Maria Luisa chirps like a little bird. She shows it around and doesn’t realize that somebody else is paying for it. She strongly believes that fate is acting in our favour. Despite any religious belief Paolo and Marisa buy it for her, and this is the true miracle. We get on the jeeps to go to the temple where the langar is. It’s a gurdwara on the lake, an ancient view, the water, passing reflections. I’m hot, I took the warm shawl this morning and inside the temple you always need to cover yourself. Jaswinder goes inside and comes back with a burgundy and golden damask piece of fabric, still smelling of every head that has worn it. I don’t dare to say anything, I think of lice jumping on my head. I accept his kindness and go inside. The ritual of kneeling down, circling the altar, sitting cross-legged in front of the Guru Granth Sahib, every Gurus’ wisdom, the recorders of God’s words. More monkeys, we hope that they won’t take our shoes. We take some pictures, look for a bathroom, which is not worse than a latrine in a forgotten war zone. It’s time to try the langar, the refectory of the temple that Amar Das decided to establish to give everybody something to eat. It’s a daring undertaking after the easy life at the white and clean guesthouse. Jaswinder tells us what to do, where to sit, heads always covered. I’m temporarily as meek as a sheep and follow him step by step. Again I get upset about the filth, in the refectory western detergents haven’t been used enough, quick associations, everybody has eaten on those dishes. The mat is covered with stains and smells. It’s still wet in some spots. From a rusted can an old man serves us lentils and chapati. “Sat nam.” We pray, purify our food, no one will get sick. Out of sympathy they give us some spoons. We’re not able to use chapati as cutlery. We wash our dish and it would have been better if we hadn’t. It’s the same water used for who knows how many dishes, a questionable foam, and another tub to rinse the dishes, with still not flowing water. We go out, the sun cleanses everything. Gurusandesh drags along her warriors, takes pictures and chats. We get in our cars and drive to an Indian temple among blooming trees and stalls of souvenirs. Jaswinder gives us a present: handkerchiefs with the sign of the shakti, no roses in this land of absence but signs and prayers, treacherous weapons for my heart. Colourful women and girls laughing, they give us plenty of smiles, even gods kneel to their words and their kindness. We zigzag through the souvenirs stalls, the most aggressive beggars stretch their hands; a huge clearance. Another Gurdwara where the ritual for the dead is performed. People turned into ashes are scattered in the river, flowers and tears will take them to a better world. I’m tired and I don’t want to stop. I want to go back home. We take different ways. Some people stay, the others go. The gate of the guesthouse, the guards, we need to write a birthday card for Sadhana. We decided to buy the Guru Granth Sahib at Amristar, an awesome idea. We thought we had the perfect present, but we didn’t know at that time what it would have meant travelling with the Guru. Paola and Camilla will cook pasta tonight. Great! We rush the whole day through quiet India, times overlap frantically, class on the Japji, yoga class, guru Gobind Singh, a warrior, courageous and fair. The last Guru who left God’s words to continue the mission, the Guru Granth Sahib, the exercises for the tenth body, the thin body that can change our destinies. We put a lot of effort in these exercises. We all want a dramatic change in our lives. Once more I try to give an order to my numerological design, but the synthesis isn’t so clear. Nonetheless, we all are surely blessed and loved by God. This is the only thing I’m always sure of. We start to make preparations for this evening, a long table decorated like a Christmas tree, with all the little lights and the flowers, that Monty loves, placed everywhere. The Indian chefs are cooking frantically while Paola and Camilla have disappeared into the kitchen. The others are taking a shower and think about what to wear for dinner. It’s a real party. After sunset the little lights shine even more. The table is wonderful, we are beautiful, how much grace in this remote country. I get confused looking at Jaswinder, at the night, the faces, the stars, Sadhana deeply touched by our card. Smiles, hunger, Avtar is dancing on the lawn with grace and perfection, among veils, the smells from the kitchen, and an orchestra of cicadas. Peace. Paola and Camilla have cooked pasta that will grant them a place in Paradise. In this very last night new destinies are created that no one knows of. Days will pass, for somebody maybe months or even years, but who can read those sign in the sky with all those stars? Wrapped in our shawls we reach the room for the sadhana. We sit legs crossed. We breathe slowly and deeply. There’s a change in our schedule. Simona had another fit last night and Avtar calls us to pray for her healing. We sit down like sleepy Shamans, arms stretched in front of us to bring about good while singing the mantra “Ra ma da sa, sa se so ong.” Looking at Simona’s ashen face I think that it won’t be enough, better a western medical technique. The nice vibrations though broaden the room and comfort our hearts. Half an hour, an hour? I don’t know. I just lower my arms and leave my hands doing what they have to do. The sunshine takes us back to the open air. We’re spending our last hours in this magic kingdom, we’ll leave after breakfast. In a few hours the rite of the eighty-four steps, much feared, desired and unconsciously sought after. This morning we are less noisy, departures always create a void. We’re concerned about Simona’s health. Suria serves us the leftover pasta for breakfast. Most of us are not really happy about it, luckily there’s something else to eat. The sun is shining. Monty will leave with us and this makes me feel better. He seems to be the most reliable man at this moment. We go to pack. Jaswinder arrives, shows one of his Indian smiles and goes to examine Simona. His decision to take her to the hospital for an X-ray takes us by surprise. She doesn’t have any strength to refuse now. Sadhana goes with them. Slowly we all get ready and start to loaf around the rooms, the lawn, upstairs. It’s time for pictures, with and without turbans. I ask Gurusandesh to make me a turban. It’s too tight on my head. My ears are losing their sensitivity and my head is choking. Pictures with Monty, Suria, of our group, half group, pictures of Jogi Bajan’s House, of flowers, with Franciane, Michelle, the cooks and other weird shots for which we won’t become famous. My neck is stiff and my mood is uncertain. Even though life seems satisfying here, there is always something missing. The sun is high. Our bus is ready, Sadhana, Jaswinder and Simona are not here yet. Monty keeps cutting flowers to take with us. Franciane and Michelle will reach us at Amristar. The drivers load our suitcases and even the Camille are quiet. It’s very warm in the room. Our schedule has to be rearranged. When will we arrive at Goindwal? Both Camilla and Manù want to stay with Simona. They start a competition. Manù wins. She’s always been the good one. With that gentle smile of hers, she’s never a burden to anyone. Manù gets ready to say goodbye. Simona and Manù will join us at Goindwal in two days. Camilla cries over their separation and Manù’s sacrifice, but she hides her sorrow behind her dark glasses and so avoids consolation. We must leave someone behind. The bus is steaming hot. Monty’s small vase of flowers overturns and yellow marigolds lie in front of me. I never liked to see life fading away. Jaswinder sits beside me. The game of seats has just begun. My companions thinking, smiling and making any kind of comments will often leave a free seat to let us sit side-by-side. Every bus trip turns into a close encounter that begins to disturb my peace and doesn’t seem to have a future. Jaswinder sits down. While staring at me deeply, he takes my hand and reads it; a hand with thousands of lines and he doesn’t know where to start. He is touched, turns to look at the landscape and then tells me the truth written on my palm. My suffering, my past, my exceeding pain, the continuous loss of somebody or something. The future is missing. The reassurance of a good thing. Nobody ever says anything about it. During faithful days everything is fine but other days neither peace nor pause but knives stabbing my soul which cannot even die. Jaswinder keeps examining my palm. He follows another line that goes faraway. He holds my hand in his long hands, the same hands he uses to treat people. It’s difficult to talk Indian-English, but I try all the same to investigate him, his youth, his lovers, dreams and ideas. He’s young and uptight. He doesn’t know anything about women. “My mother, my sister.” He thinks he knows something. He’s still a naive and ignorant virgin. A tough nut to crack. I don’t understand. Why did I have to meet this most praised guy who dresses like a good guy and speaks words of perfection? Me, the one who tries to learn from experience the possibilities of love, who drives smells and flavours to the centre of the earth, who sweats and kisses and starts back again? But after all what do I want from him? A one-night stand or the warmth of a relationship? Sometimes all I need is a moment of love, hugging a body to remember what affection is like, a sip of water to cross the desert. I choose a soft approach, no initiative, an old-school approach, a form of romanticism that isn’t daring or seeking. I don’t want to upset his innocence.